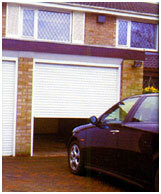 Roller garage doors combine the convenience of power operation with the advantage of smooth vertical opening. This allows you to park right up to the door, whilst the pocket sized transmitter enables you to open and close the door from inside the car. Meanwhile the tightly coiling curtain creates more space inside your garage to accommodate high top off road vehicles or people carriers. 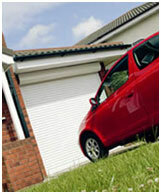 Every door is made to measure so it fits your garage perfectly. It is manufactured from strong corrosion resistant aluminium with an insulating core and comes in a range of stylish colours.